After completing vocational training as a qualified banker in Frankfurt, Markus Lötzsch graduated in law sciences. After initially working in a law firm in Munich and for the Bavarian Ministry of Economic Affairs and Media, Energy and Technology, Mr. Lötzsch was employed as deputy managing director at “Bayern International GmbH” and chairman of the managing board of “Wirtschaftsförderung Sachsen GmbH” (Promotion of Economic Development in Saxony). 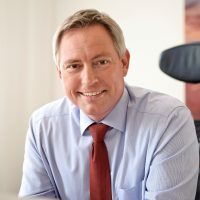 Since 2008, Markus Lötzsch has been the Chief Executive Officer at the Nuremberg Chamber of Commerce and Industry, an organization of around 145,000 member companies. The philosophy of the Nuremberg Chamber of Commerce and Industry is self-governance of the private sector economy. The Nuremberg Chamber of Commerce and Industry supports the integration of refugees through programs that help find vocational training and employment. Check.work is an assessment procedure consisting of two modules to analyze potential and assess skills. Module 1 assesses existing skills, knowledge, and abilities; it is image based and can be completed without extensive language skills. Module 2 assesses interests, likes, and dislikes using simple German language. AzubiScouts provides an opportunity for trainees with a migrant bbackground to visit BIK school classes (special classes for young immigrants) and present the Vocational Education and Training system and the associated career paths. They also host job fairs to bring together refugees and employers and consultation hour, an open consultation hour for immigrants, where it is possible to get advice on training and job opportunities (on a drop-in basis, to avoid language-related barriers to making an appointment). After refugees have found vocational training, the Nuremberg Chamber of Commerce and Industry provides support to prepare for training and continues to do so for the duration of the traineeship. AzubiStarterWoche (trainee starter week) is an induction week for immigrants before the vocational training program begins. The aim is specific preparation for the training program to avoid problems that might arise due to intercultural differences. AzubiStarterCoaching offers monthly support in the first year of the vocational training program with the aim of recognizing early on if someone is at risk of dropping out and taking counter-measures to ensure that they remain in the program. Immigrants who cannot complete a vocational education or training program for personal reasons can complete individual modules of a Vocational Training program (minimum of 6 months each) within the framework of the Modular Qualification Programme, a low-threshold program for adults over 25. The results for each module are confirmed in a certificate; over time this can even lead to a full professional qualification.